Ramallah – Prime Minister Rami Hamdallah delivered the “Arafat Prize” to Michel Sabbah, Patriarch Emeritus of Jerusalem of the Latins, for the exceptional role he carried out in serving “the cause of Palestine and Jerusalem”. The award ceremony was held on Friday, November 10, at the Ramallah Culture Palace. The same honor was also given to Muhammad Ahmad Hussein, the Grand Mufti of Jerusalem. In his speech at the awards ceremony organized by the Arafat Foundation thirteen years after the Palestinian leader’s death, Patriarch Emeritus Sabbah invited Palestinian leaders to ask God for wisdom to prepare for peace and make it possible. 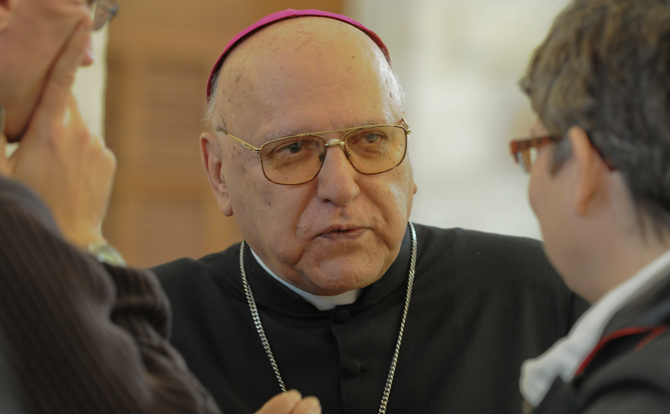 “We continue to suffer for a global hurricane that threatens us and the entire region”, said Patriarch emeritus, inviting everyone to trust in the Almighty: “The Almighty God speaks of peace”, said Sabbah, among other things Sabbah “and the rulers of this world speak of war”. The prize received – added the Emeritus Patriarch of Jerusalem of the Latins “reminds us that President Arafat inaugurated the dream of a Palestinian State. We see that dream from afar. But we believe that dream will really come true”.